Today I made oozes of jam with the huge amount of crab apples I picked from up on the moor. 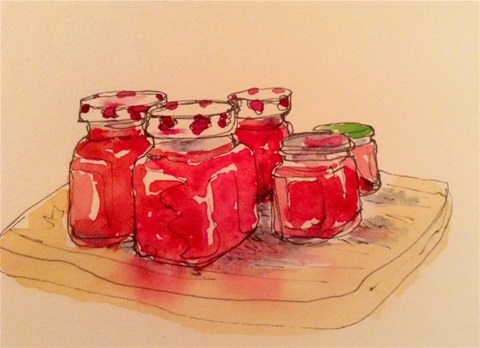 My dear friend Sarah painted as I cooked and the picture is the result, as well as the jam of course! These rather tart apples will also freeze well if you want to save the cooking until a later date. Just remove the blossom ends and stems then give them a quick rinse. Place them on a tray in single layers and freeze. Once frozen, place in freezer bags and they should keep up to three months. There are many things you can do with crab apples, such as crab apple butter, spiced pickled crab apples and of course the crab apple jelly. But I have discovered that these small sharp apples also make good bread. Cook in an oven already heated to 180c for 40 – 45 minutes or until done! Sounds a wee bit like a cake! Happy experimenting! Now to clean up the kitchen! This is the part I do reluctantly!